Our Bergamot essential oil (Citrus aurantium var. bergamia) has a rich, juicy, sweet, fruity bouquet with an elegant herbaceous, balsamic undertone. This cooling oil is calming and relieves nervous tension. It is one of our favorite mood uplifting oils and can also improve mental clarity and sharpen senses. Apply directly to an insect bite to relieve itchiness and irritation (great to combine with blue chamomile). Add to a carrier oil such as apricot kernel oil for a daily moisturizer (smells great with vanilla). Add several drops to a hydrosol or water base and use as a body or room spritzer. chamomile blue, clary sage, eucalyptus, fir essential oils, frankincense, ginger, graperfruit, juniper berry, lavender, lemon, lime, neroli, palmarosa, patchouli, rose, sandalwood, vanilla and ylang. Fun facts: The oil is produced from a rind of a fruit similar to the bitter orange. The oil is used in a black tea to create Earl Grey. The bergamot fruit should not be confused with the bergamot herb aka bee balm (mint family). Cautions: Generally non-toxic and non-irritating. 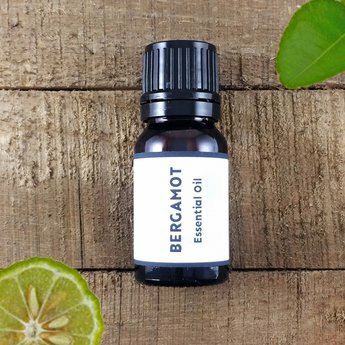 Bergamot is usually extremely phototoxic but our bergamot is bergaptene free which means the bergamot has had a furocoumarin, a skin sensitizer found in bergamot and many citrus essential oils, removed.